The R.sole concept was to create a prototype for a high end sneaker boutique designed as a gallery space with the shoe collector in mind. Custom wall displays consist of various LED color-changing showcase niches and other elements organized in geometric patterns reinforcing the overall feeling of “hip museum” and “art gallery”. The dark gray finish of the millwork, walls, floor and ceiling surround lighted displays and create dramatic contrast, enhancing the art gallery atmosphere and highlighting the colorful merchandise. Freestanding translucent acrylic display panels rotate and lock in place as required in order to transform the space and create flexibility in merchandising. The storefront glass is covered with translucent vinyl with geometrically organized voids complimenting the overall design aesthetic. 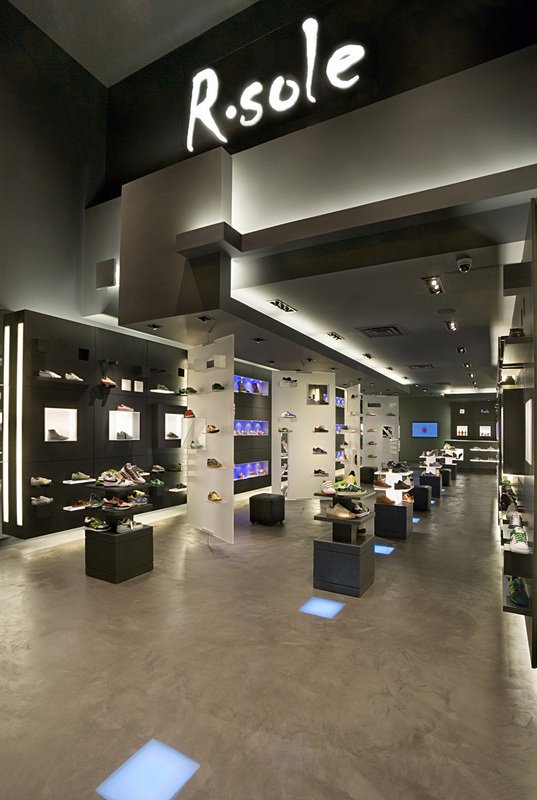 The R.sole design, recognized with many design awards as an imaginative blend of retail and entertainment, provides a unique synergy that supports the retail experience and helps create an exciting and memorable destination.